Rides and roller coasters will be just rides, sorted into a whole range of different categories including coaster, flat rides, water rides, water slides, kids rides, etc. The decision to make these changes are based on what's been learnt over the past three years. I'd be particularly interested to hear if anyone has any comments on the features that are being removed. Now for the good parts... We will be renaming to Parkz. The URL will be www.parkz.com.au. Why the rename? Roller-Coaster.com.au is too long, it's also very generic (i.e. it doesn't really offer us a cohesive and unique identity). 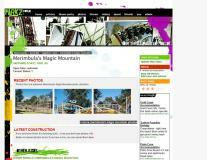 It also is a bit misleading as this isn't a site that is all about roller coasters, but rather parks in general. Parkz was chosen because it's very short, unique and describes perfectly what we are all about. The site will cease to be an Australia-centric site. We will still maintain our high level of coverage on the Australian theme park industry, but in addition to this we will also start covering news from theme parks across the world. Basically the idea is instead of having a new article go up every week or so, we will try to have fresh news on the site all the time. Eventually we will be able to sort news by country if you only want to see news from one particular country. Users will now be able to upload their own photos into our gallery. Each photo will be tagged so it's perfectly linked up with the database. Full credit will also be given on each gallery page and people will be able to sort by photographer. Each user will have their own profile page showing the latest content they've contributed to the site. Photos will not go up immediately; they will enter a queue at our end to verify for quality etc. For articles and parks, there is now a tags system that means articles and photos can be tagged with more than one park or ride. A photo which has two rides in it will then be seen in the gallery for both rides, or an article about Dreamworld and Movie World will be accessible from both parks. As with the current site, users will be able to add articles as well as add new database entries and edit existing ones. The process has been vastly streamlined and improved so it's easier for anyone to do. Database entry stats (length, speed, height etc.) use a new dynamic system that allows a virtually limitless number of different and custom stats. Parks will also be categorised by owner and resort so that you can easily get from one to another within a chain (like Six Flags) or a resort (like Walt Disney World). All content currently seen here will be ported across. 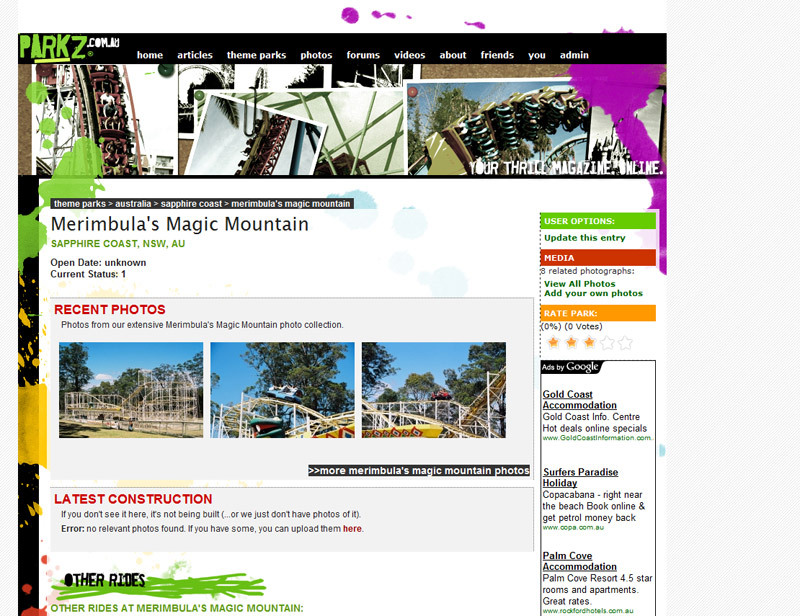 Roller-Coaster.com.au will continue to operate but will redirect users to Parkz. The forums will remain exactly the same but the URL will change. I honestly haven't decided if the forums will be changed down the track to reflect the international focus of the site, but at least in the short-term nothing will change. I anticipate that the site will launch in early January. It's actually very nearly finished right now, but there will be an exhaustive beta testing process which I hope to get many members involved in -- more on that soon! 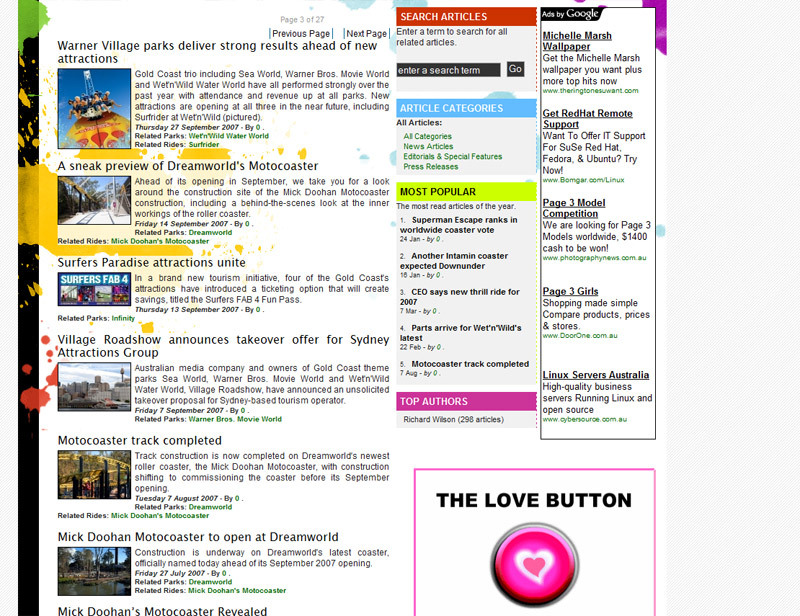 A screenshot of the main page is seen below. As always I'm very eager to hear any comments, suggestions etc. Being first to reply.. that's such good news. A big step forward for the site which I am proud to be a member of. Change is always good. I love the new concept - it's very cool. I wasn't too keen on the name 'Parkz' until I had a look at the screenshot and it sort of reflects the overall concept of the new site in a sense. I love the new layout... although (even though Superman is there) I would love to see a more Australian-based top banner considering that it ultimately still is an Australian site. Hopefully we'll see a B&M Hyper in Australia soon and you won't need to change it at all What I want to know is if the latest posts thing on the front page will still be there. Sounds good, I guess you cant help but feel we are losing a point of difference by being Australia's park site, but ultimately a worldwide focus is going to be better in the long term. As for the loss of the features, Its no biggie. With the rating system we had, there was an issue of people writing crap reviews, or irrelevant comments (eg saying "I cant wait for this to open" in the reviews section of a ride under construction ) Might I suggest replacing it with a simple 1 to 10 rating system (out of 5 was too limiting) so users can still get a rough idea of how good a ride is. As for how the front page look, as I have said the style is great and the header and navigation bar of the page looks great. 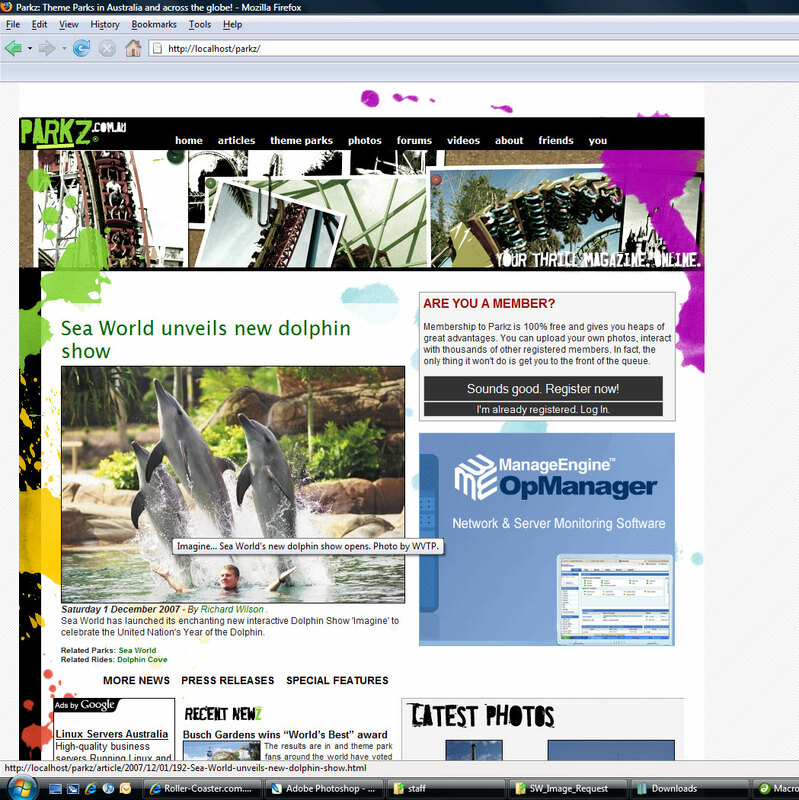 But below that everything needs to line up a bit more (eg the latest photos bit should be the same width as the 'OpManager' ad banner, the Ads By Google on the left should line up with the edge of the dolphin photo, the top of the text that says "Sea World unveils new dolphin show should be level with the "Are you a member" box....I know, im picky), and the 3 links (more news, press releases, special features) aren't conspicious enough. Edit: and Myk has the right idea, it would be cool if the pinboard of photos was dominated by Aussie rides rather than American ones...gotta show a bit of national pride. I agree with myk. The front banner/page should be Australian. Doesn't really matter too much, but I think the white gap above the main site header should not be there, it just looks a tad sloppy. I think it would look much neater if the gap between the top of the browser and where the header stars could probably be significantly reduced. 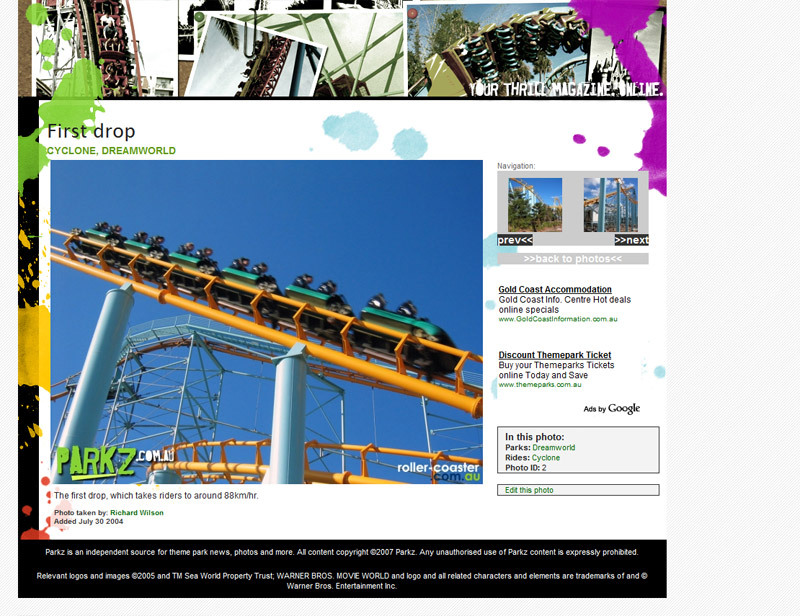 Just on the topic of the banner, you stated above richard that you are trying to kill the genuine conception that the site is just about RollerCoasters, well, the Top banner image is a very Coaster Centric image, which gives me a general first off opinion that the site is just about Roller Coasters. Just food for thought. Anyway, I wish you and your team success with your newest venture. Richo, I'll also be happy to test Parkz out, and it's really looking great so far! I cant wait to see it fully done! Keep up the great work Richard! Will we have to re-register? Sorry if you already answered this. looks great, can't wait to use it when you put it up. So you are not going to theme the forum to fit the site? just leaving it as is? I might clarify what I meant about the ratings. 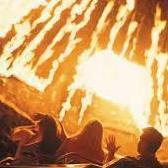 All it would involve is people rating a ride out of 10, and then the average score would be shown on the rides' database entry. At least that way there would be a simple way of determining 'top rides, top parks etc'. Because of the International focus people might be interested in getting a rough idea of how good these overseas rides are they are yet to ride, and likewise overseas members could get an idea about our rides. If you felt really inspired, have a little graphical gauge to go along with the ranking.....paint splats instead of stars? Oh sorry Gazza I missed that one. Yeah I do hope to have a rating system (without the need for written comments), either when we launch or not long after. I totally understand the feeling about the shift towards international. The way I see it, it won't change the level of coverage, but rather it will add new depth. I feel that this site's style of reporting is totally unique to us and I think we can offer a genuine alternative to other international sites, because my feeling has always been that they for the most part are very stale, in particular the US sites (some of the European sites are fantastic). For this reason I will be introducing very early on a system to filter only one country's news, and it'll be stored in your user details. The plan will also be so that eventually if you access the site from www.parkz.com.au, it'll by default be Australian news, with US/UK/etc. 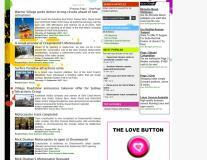 news accessible from another URL. At the end of the day for this site to continue to grow I feel that we've reached a crossroads. I feel that we've expanded as much as the Australian market alone will allow us to. The cold hard fact is for this site to be able to do what I want it to do, and for me to be able to take it there, it needs to be financially viable; just a fact of life. As far as the loss of our very good search engine rankings, the new site has been designed to be search engine optimised (SEO), and the transition period will mean that existing high rankings will redirect to Parkz, such that over time we will be able to equal and eventually beat R-C's very strong rankings. feel that this site's style of reporting is totally unique to us and I think we can offer a genuine alternative to other international sites, because my feeling has always been that they for the most part are very stale, in particular the US sites (some of the European sites are fantastic). For this reason I will be introducing very early on a system to filter only one country's news, and it'll be stored in your user details. The plan will also be so that eventually if you access the site from www.parkz.com.au, it'll by default be Australian news, with US/UK/etc. 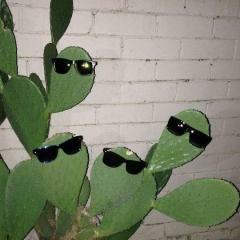 news accessible from another URL. I'm glad you brought that up, the European sites are a sort of hidden gem, content wise they are unbeaten, and they too have a very factual based and professional style of reporting (impressive considering they are often the site teams second language) You really could make waves with your style. The community style photo galleries are something unique too, the way it is with most coaster sites is that you would have to go through the admin if you want to add to the galleries, this way its easy for anyone to do it, and people would upload theme park photos on here as freely as they upload videos on youtube. Re the concern about Australian coverage, maybe have a couple of columns with headers of news, one Australian and one user selectable. I don't really know much about web design or whatever but that is what i was sort of thinking...its a bit like how in some newspapers they have a 'quick read' page with headers like state, local, international news. i think the overhaul will be good, assuming the primary focus of the site will still be Australian, being an Australian site, with primarily Australian members. I personally have limited interest in international parks, It's unlikely for me to visit them much. 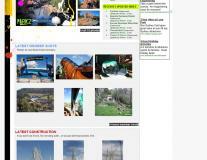 I also like the current site presents with an Australian focus. Makes the site relevant, compared with other more generic sites around. I truly hope it doesn't lose it's Australian focus. Have to agree. I prefer to holiday in Australia knowing that my $ will get full value and it's helping our economy plus keeping jobs. I personally don't have any real issue with International coverage now actually, so long as it doesn't displace Australian coverage (And Richo has said it won't) If anything it makes things easier since Parkz will be more of a one stop shop, and I wont be forced as much to deal with other sites. Just another little point though, what will happen with Total Thrills, that is basically a gallery site, and the photos in there will fit into Parkz anyway....will it die a quiet death? But still, seeing the world is a lot of fun and opens you up to new ideas, and lets you do things you simply cant do here, plus the Australian dollar is going strong, so its purchasing power parity means places like America end up having lower expenses during your trip. And anyway, if we don't visit other countries, then why should foreigners visit us? As said, there's no reason to think that the level of Australian coverage will be any different. Initially international coverage will be fairly light, but I expect it to grow with time. Australian news will dominate in the short-term, and by the time we get to a stage where there's more international than Australian, it'll be designed so that you can be selective about which you want to see. 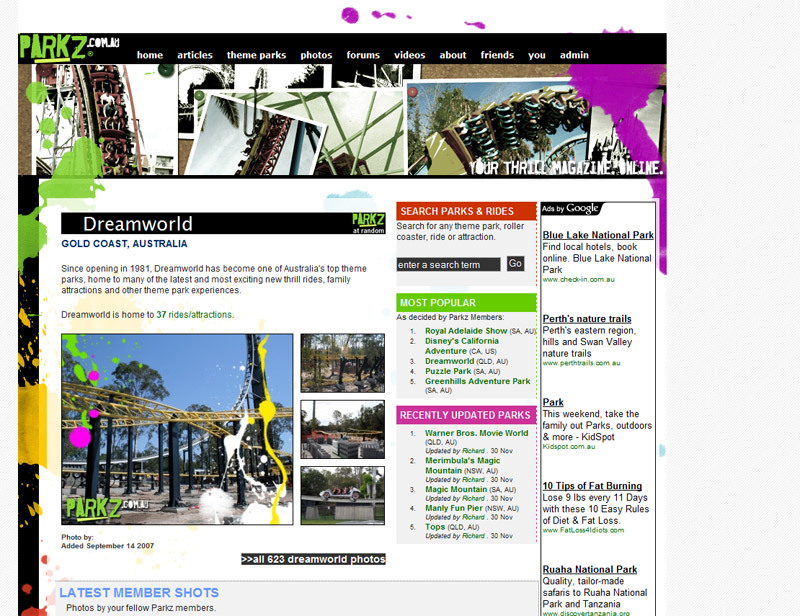 The www.parkz.com.au site will be set to Australian-only by default when that time comes. More excitingly I think is the fact that the database will be opened up to international parks and with the accompanying gallery, hopefully there will be new photos to check out very frequently so instead of new photos monthly, it'll be weekly or daily. As far as Total Thrills goes, I think it's been dying a slow death for a long time now as I really don't have the time to be maintaining two separate sites. I expect with time I'll get the photos that are there moved across, and add the many more I have collected since then. Just so you all know, things are making good progress and I anticipate beta testing could commence as early as this week. Site launch is well on track for early January. I don't anticipate any changes to the forums in the forseeable future. If there were to be some sudden influx of international members down the track, I'd be more inclined to start afresh and keep these forums going exactly as they are. More than anything else I think these forums are an incredible resource and it would be a big loss if there weren't some Australian theme park forums of merit.